The U.S. Navy is committed to the expedited development, procurement, and operational fielding of “families” of unmanned undersea vehicles (UUVs) and unmanned surface vessels (USVs). 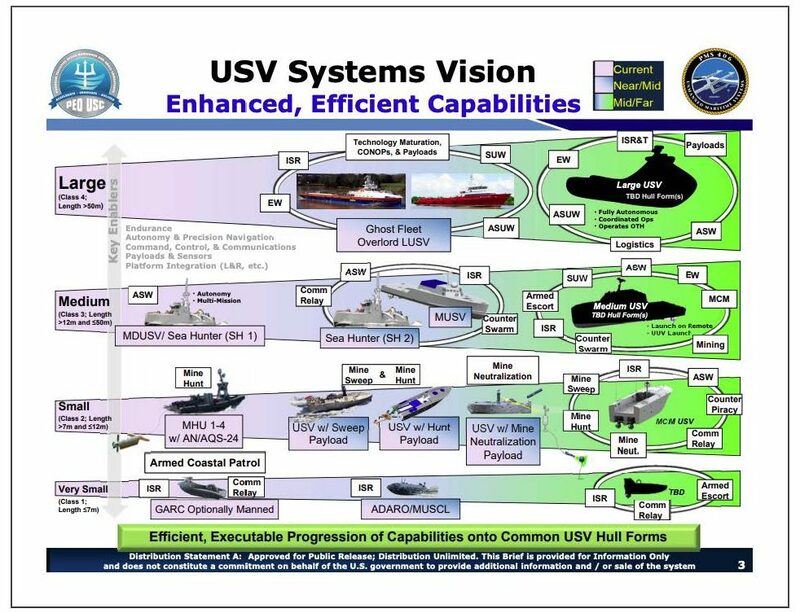 CNO Adm. John Richardson’s Design for Maintaining Maritime Superiority (Version 2.0) explicitly calls for the delivery of new types of USVs and UUVs as rapidly as possible. My office now manages more than a dozen separate efforts across the UUV and USV domains, and that number continues to increase. The Navy’s commitment to unmanned systems is strongly reinforced in the service’s FY2020 budget with the launching of a new high-priority program and key component of the Future Surface Combatant Force — the Large Unmanned Surface Vessel (LUSV) — along with the funding required to ensure the program moves as rapidly as possible through the acquisition process. This effort is closely aligned with the Medium Unmanned Surface Vessel (MUSV) rapid prototyping program started in FY19. 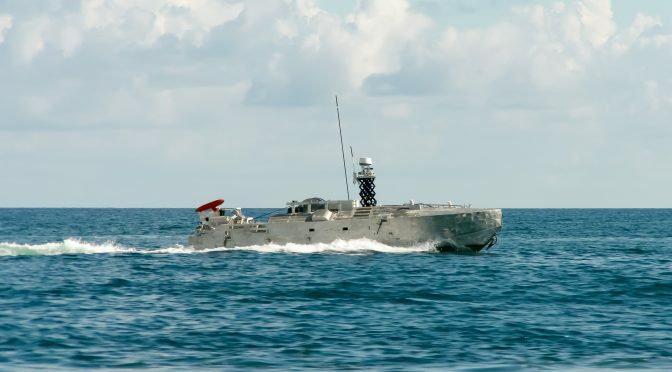 Mine Countermeasures USV (MCM USV) efforts have several key milestones in FY19 with Milestone C and low-rate initial production of the minesweeping variant and the start of minehunting integration efforts. On the UUV side, the ORCA Extra Large UUV (XLUUV) program has commenced the fabrication of five systems that are expected to begin testing in late 2020. The Snakehead submarine-launched Large Displacement UUV (LDUUV) is wrapping up detailed design and an operational prototype will be ready for Fleet experimentation by 2021. Several medium UUV programs continue in development, production, and deployment including Mark 18, Razorback, and Knifefish. So these new and different systems are coming online relatively quickly. Supporting the established families of UUVs and USVs are a number of Core Technology standardization efforts in the areas of battery technology, autonomy architecture, command and control, and machinery control. While these architecture frameworks have stabilized and schedules have been established, there are still a host of logistical and sustainability issues that the Navy must work through. Most of these unmanned platforms do not immediately align with long-established support frameworks for surface ships and submarines. These are critical issues and will impact the operational viability of both UUVs and USVs if they are not fully evaluated and thought through before these systems join the Fleet. Where should the future “fleets” of UUVs and USVs be based or distributed? How or where will these systems be forward deployed? What sort of transportation infrastructure is required? What is the manning scheme required to support unmanned systems? How and where will these unique systems be tested and evaluated? How do we test endurance, autonomy, and reliability? What new policies or changes to existing policies are required? How will these systems be supported? What new training infrastructure is required? To help jumpstart new thinking and address these questions and many others we have yet to consider, my office is partnering with the Center for International Maritime Security (CIMSEC) to launch a Special Topic Week series to solicit ideas and solutions. We are looking for bold suggestions and innovative approaches. Unmanned systems are clearly a growing part of the future Navy. We need to think now about the changes these systems will bring and ensure their introduction allows their capabilities to be exploited to the fullest. CAPT Pete Small was commissioned in 1995 from the NROTC at the University of Virginia where he earned a Bachelor of Science Degree in Mechanical Engineering. He earned a Master of Science Degree in Operations Research in 2002 from Columbia University, and a Master of Science Degree in Mechanical Engineering and a Naval Engineer Degree in 2005 from the Massachusetts Institute of Technology. He is currently serving as Program Manager PMS 406, Unmanned Maritime Systems.